Immigration and Customs Enforcement (ICE) announced yesterday that it has for the first time “dismantled” an antiquities smuggling network operating in the United States. Charges have been brought against individuals before, but this is appears from the indictment to be a pretty complete looting network, operating in the Middle East and the United States, which has been uncovered. According to the federal indictment four men have been charged with smuggling antiquities into the United States. It alleges that four men operated a smuggling operation which sent objects from Egypt to Dubai and its freeports and on to the United States. The federal agents also note that there was money laundering involved here, perhaps a tangible case implicating organized criminal activities to antiquities smuggling. Dubai has freeports, much like Switzerland does. These are special areas which allow for the ease of international commerce, but can also be a haven to looters and smugglers. Giacomo Medici of course operated a very posh looted antiquities showroom from a Swiss freeport for many years. As the tension and unrest in many Middle-Eastern countries emerges, will Dubai become a focus for antiquities investigations? A haven for looters? I would suspect that Dubai will be far more willing and able to police and investigate on the looting of objects and stolen artifacts. I have a PhD colleague who currently works in their copyright enforcement force, and I would imagine that if nations ask for enforcement assistance from Dubai, they will likely receive it. The investigation began when ICE Special Agent Brenton Easter and his team were looking for a terracotta head which was uncovered in Iraq in 2000, and the investigation uncovered an international smuggling ring. This is an example of what appears to be a very successful operation which has targeted all of the individuals in the ring, including the conduit from the thieves or looters in the Middle East, “the broker”, “the individual providing false provenance”, and “the end-all collector”. One of the objects, pictured here was a Greco-Roman-style Egyptian sarcophagus which might be worth as much as $2.5 million. The indicted men are Mousa Khouli (Windsor Antiquities, NY), Salem Alshdaifat (Holyland Numismatics, West Bloomfield MI), Joseph A. Lewis, II (collector of Egyptian antiquities), and Ayman Ramadan (Nafertiti Eastern Sculptures Trading, Dubai). 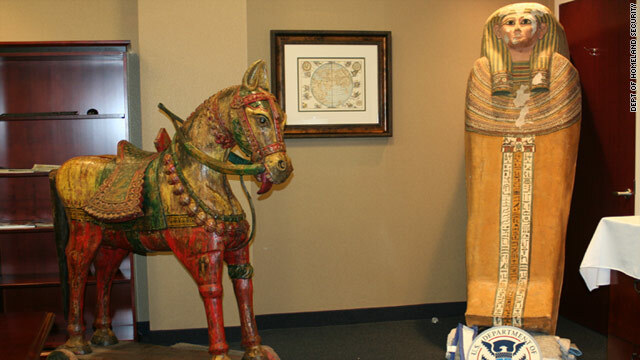 ICE makes arrests and seizes cultural artifacts stolen from Egypt, (2011), http://www.ice.gov/news/releases/1107/110714newyork.htm (last visited Jul 15, 2011). Keith Johnson, Alleged Antiquities Smugglers Busted, wsj.com, July 15, 2011, http://online.wsj.com/article/SB10001424052702304223804576446313624549304.html (last visited Jul 15, 2011). Kiran Khalid, Feds: Global antiquities smuggling ring dismantled CNN (2011), http://edition.cnn.com/2011/CRIME/07/15/new.york.antiquities.smuggling/ (last visited Jul 15, 2011). Feds accuse 4 of smuggling Egyptian artifacts, Reuters (2011), http://newsandinsight.thomsonreuters.com/Legal/News/2011/07_-_July/Feds_accuse_4_of_smuggling_Egyptian_artifacts/ (last visited Jul 15, 2011). 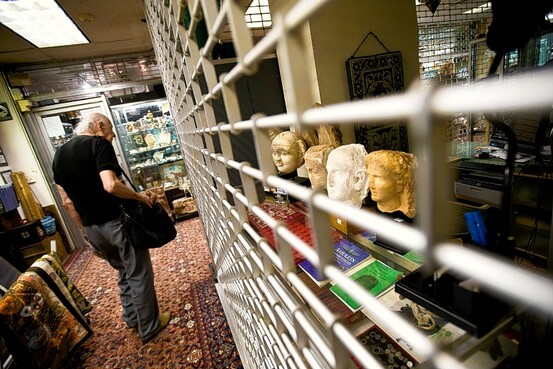 Kate Taylor, Federal Authorities Charge 4 People in Antiquities Smuggling, The New York Times, July 14, 2011, http://www.nytimes.com/2011/07/15/arts/design/federal-authorities-charge-4-people-in-antiquities-smuggling.html?_r=1 (last visited Jul 15, 2011).